THE manufacture of machine tools for use in engineering workshops forms an industry within an industry. A firm making locomotives or turbines, for instance, does not make its own tools, but buys them from firms which make nothing else. The machine-tool industry is highly-specialized, and a number of British firms with world-wide reputations have spent enormous sums in research and experiment to meet the demands of the manufacturing engineer for powerful machine tools capable of high rates of production. The number of different kinds of machine tools in daily use and the huge dimensions that some of them have now attained are surprising. An example is here shown of a large plano-milling machine at work on the machining of part of a diesel engine bedplate. The machine is an ingenious combination of two older forms of tool, the planing machine and the milling machine. 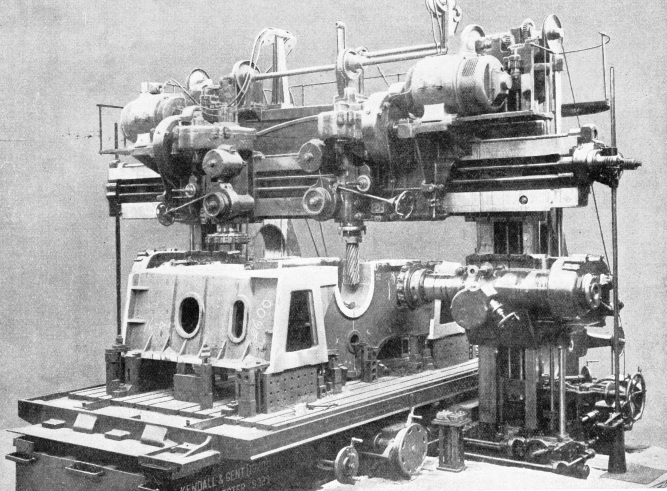 The machine illustrated, made by Kendall and Gent (1920), Ltd, of Manchester, can machine parts as large as 20 feet long, 12 feet wide and 8 feet high. Of the two cutting heads on the cross slide, one is shown fitted with a side cutter, a rotating tool with a number of spiral cutting edges. This is being used to machine the main bearing recess of the bedplate, the head being automatically traversed along the slides as the cutter rotates. The bedplate does not move. The other cross slide head and the two heads on the side columns are each shown fitted with a face cutter, that is, with a rotating disk from the face of which project a number of tools arranged in a circle. The face cutters have finished their work, which was the machining of flat surfaces on the top and sides of the bedplate. When this was being done a face cutter was also fitted to the right-hand cross slide head and the bedplate, which is firmly bolted to the table, was carried backwards and forwards by the table as all the four cutters revolved. The top cutters were traversed inwards and the side cutters upwards as the cut progressed. The cross slide can be moved up or down on the columns. The side heads can also be moved up or down. All four spindles can be moved longitudinally in the heads to suit the dimensions of the work. All the cutters are driven by separate electric motors. One great advantage of such a machine is the large number of surfaces that can be machined in different planes without the work having to be reset.